I've just finished processing a few more panoramas, so I thought I'd share them here on the blog. I'll start off with this photo taken in a forest clearing just off the track partway up Kehlstein in Bavaria. Kehlstein is a famous mountain (technically a subpeak of Hoher Göll mountain) where Hitler's Eagle's nest was built. 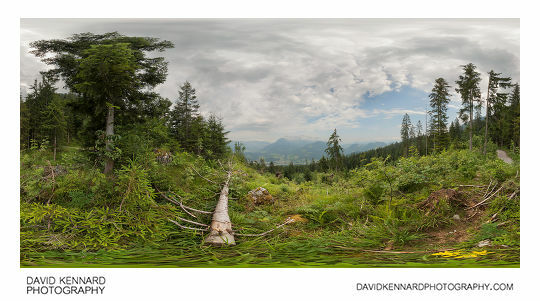 You can see the interactive panorama version here: View NE partway up Kehlstein, Bavaria 360 VR. Processing this panorama was very difficult as the trees were blowing about in the wind and I needed to bracket ±1.3EV to avoid blowing out the sky while still capturing detail in the landscape. So, when it came to blending the exposures in Photoshop there were big problems due to the trees moving between the different exposures. If you look at the tops of the trees (in the 360VR version), you'll probably notice the branches are a bit blurry. I decided that having blurry branches was better than having well defined branches but underexposed landscape or overexposed sky. Unfortunately I don't think there is any way to avoid this problem when it is windy (which is most of the time). This next one is from Chişinău (pronounced Kishi-now, to me the cyrillic spelling of Кишинэу - Kishineu reads more like how it is meant to be pronounced, but I'm sure Chişinău reads correctly to those that understand Romanian), in Moldova. 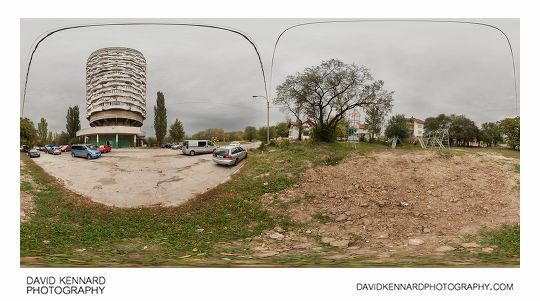 You can see the interactive panorama version here: Romashka Tower, Chișinău (Corn cob building) 360 VR. As you can see, it was rather cloudy and overcast. Sadly it was overcast or raining just about all the time we were in Moldova. I found out about this building from the book Cosmic Communist Constructions Photographed (CCCP), where it is referred to as The Ear of Corn . Finding where the building was (in planning before the trip) was pretty difficult as the book doesn't provide any location data other than it being in Chișinău. But I did manage to locate it eventually, and so we made a point of visiting it while we were staying in Chișinău. The common name given to the building actually appears to be ‘Romashka’, Russian for a camomile flower. According to Google Maps the building's name is ‘Floare de Piatra’, meaning stone flower in Romanian, but I couldn't find other references to the building using that name. Nearby you can see a Soviet-era playground, painted in yellow and cyan colours. I get the impression there was a standard set of colours they painted all the play and exercise equipment in the USSR. There's a newer playground just across the road, so I don't think this one is used any more. Next up is a panorama from Ebisu shrine (ゑびす神社) in Kyoto, Japan. 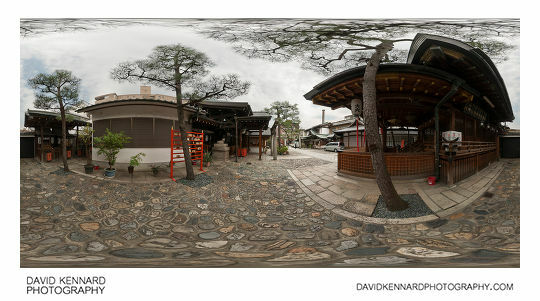 You can see the interactive panorama version here: Ebisu Jinja, Kyoto 360 VR. This panorama is taken further into the shrine than the first one that I took near the entrance. Here you can see the main hall (Haiden) to the side, and several pine trees that have been carefully concreted / paved around. You might notice the same problem with the trees being a bit blurry when you look up. Again, sadly just a product of the exposure blending process that I couldn't avoid. To finish off with, here's a panorama I took from a walk along the River Beauly near Kilmorack, in Scotland. 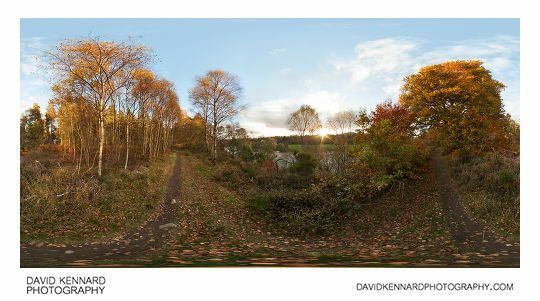 You can see the interactive panorama version here: Autumn trees by the River Beauly, Kilmorack 360 VR. This was taken near the end of walk. Most of the walk it had been cloudy, but thankfully the clouds dispersed somewhat around sunset, bringing out the golden colours of the autumn leaves.